in breads or muffins or breakfast or tea. And I simply adore cranberry desserts! This is the time of the year that cranberries are on sale. For as little as $1 a bag! And we love cranberry desserts . . . The recipe was perfect for four of them! 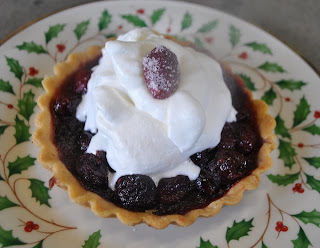 who I dubbed the "Cape Codders"
to make the tart again! Bring 1/2 cup water and the berries, sugar and cinnamon to a simmer in a medium saucepan over medium high heat. Cook, stirring, until the berries pop, about 2 minutes. Drain in a sieve set over a bowl. Return strained liquid and cinnamon stick to pan; reserve berries in a bowl. Simmer liquid over medium-low heat until thickened, about 15 minutes. Pour syrup over berries; let cool. Discard cinnamon. On a lightly floured surface, roll out dough to 1/8 inch thick. Transfer to a 9 inch round tart pan with a removable bottom (or a regular pie tin if you don’t own a tart pan). Trim edges, leaving a 1/2 inch overhang. Tuck edges of dough under to create a double thickness and press firmly again sides of pan. Press bottom of dough firmly into tart pan. Chill in freezer 20 minutes (or if you’re like me I never have room in the freezer so I refrigerate for 40 minutes). Preheat oven to 400. Line tart shell with foil and fill with pie weights or dried beans. Bake until golden brown, about 25 minutes. Transfer to a wire rack. Remove pie weights and foil. Let cool completely. Reduce oven temperature to 350. Fill tart shell with cranberry mixture and syrup from bowl. Bake until syrup is only slighlty runny and berries begin to brown, 45 to 60 minutes. (if pastry edges brown too quickly, cover with a band of foil). Meanwhile, beat cream to soft peaks. Beat in creme fraiche (if you have it); refrigerate. Let tart cool on rack until cool enough to remove from tin. Serve warm, with whipped cream. NOTE: I made 4 individual tarts instead of one big one. I am rather fond of individual desserts! When you make 4 tarts how does that change the finally cooking time? Thanks, this sounds like a perfect desert, sweet, but not too sweet, and crisp. These look delicious! I have never had cranberry tarts. I am sure I would love them! Those tarts look and sound so good, cranberries are easily available in the UK these days though that's only been the case in recent years. At one time you could buy jars of cranberry sauce and that was it. 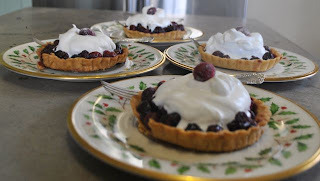 Mimi - the cooking time was less because the tarts were smaller -- I just watched until I thought they were done. Oh, I too stock up on bags of cranberries, mostly as I like to cook and have them as a side for meat dishes. The tart looks delicious Martha, I'll have to give it a try. I am printing out your recipe as I too am definitely in love with cranberries! I love cranberries in my recipes, but have never tried the fresh ones! 2013 is full of new adventures...including fresh cranberries! Thanks for the recipe!! !